We’d love your help. Let us know what’s wrong with this preview of The Uncloaked by J. Rodes. Then the killings begin, and Eliza is captured and sent to Reformation Camp for her defiance. Reality finally sinks in. To ask other readers questions about The Uncloaked, please sign up. Author J. Rodes has written a magnificent and thought provoking story in her first book in the Uncloaked Trilogy, The Uncloaked. From page one readers will be drawn into this devastating story that will make you think and rip at your heart. Rodes has a fabulous knack at storytelling that will capture the attention of readers and keep them captivating until the very end; a cliff hanging end. This book is filled with characters and a plot that will bring readers coming back for more. 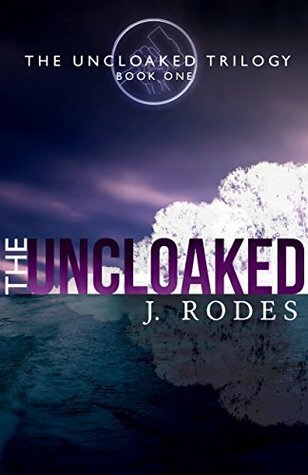 Teens will no Author J. Rodes has written a magnificent and thought provoking story in her first book in the Uncloaked Trilogy, The Uncloaked. From page one readers will be drawn into this devastating story that will make you think and rip at your heart. Rodes has a fabulous knack at storytelling that will capture the attention of readers and keep them captivating until the very end; a cliff hanging end. This book is filled with characters and a plot that will bring readers coming back for more. Teens will not want to put this fascinating story down! One of the things I love about the dystopian genre is the strength of faith. This genre causes you to self-examine yourself and your beliefs. In The Uncloaked, author J. Rodes hits that out the park. Y'all, I highlighted so many lines in the story (yay for eBooks), that I'm sure it looks like I just highlighted the entire book. Seriously, there are that many lines that make you think. Make you grapple for reality, because it's fiction, but it's so much more. In my opinion, this is a bo Oh. My. Wow! In my opinion, this is a book for the generations. A book that will have you questioning your loyalty to the great I Am and searching for your resolve if ever faced with persecution. Add this to your must read list! *I received a free copy and posted an honest review on my own, free will. This book...what can I say? Oh, I know... READ IT!! Amazingly well-written, it will make you think and consider things about yourself and the world around you. It is a little dark and edgy, but isn't that the climate we're living in? “The Uncloaked” trilogy is the thrilling dystopian/YA series from a Christian worldview you didn’t know you needed in your life. It’s a story of family, trust, friendship, loyalty, betrayal, and hardships. Overarching is an abundant theme of choice. Choice of forgiveness or bitterness, of following the Light or living in darkness, of believing in redemption for any soul or living with hate. The Christian worldview offers a realistic scenario and a reason for both the evil and hope portrayed in t “The Uncloaked” trilogy is the thrilling dystopian/YA series from a Christian worldview you didn’t know you needed in your life. It’s a story of family, trust, friendship, loyalty, betrayal, and hardships. Overarching is an abundant theme of choice. Choice of forgiveness or bitterness, of following the Light or living in darkness, of believing in redemption for any soul or living with hate. The Christian worldview offers a realistic scenario and a reason for both the evil and hope portrayed in the story. This is something rare in the dystopian genre, at least as far as I have experienced it. It makes the story an allegory of sorts that represents choices you and I have every day, to stand for the Light and choose hope. The Uncloaked sets up the environment, characters, and dilemma. It explores the real dangers of apathy with a very close-to-life scenario in the near future. Braxton begins in this book with great potential, but by story’s end makes choices that set in motion spiraling events that impact the rest of his own story. His 1st person POV serves to make him relatable even while he makes exasperating choices. This book had me riveted from its opening lines, and hasn’t let go of me yet, because I’m anxiously awaiting the next book in the series! Not to mention I can’t stop thinking about how I would react if faced with the same situation. Would I have the courage to stand, come what may, even if that meant death? Or worse . . .
Rodes’ narrator, sixteen-year-old pastor’s son Braxton Luther, is testament to her ability to bring complex human characters of any age to life on the page. Braxton is snarky bu This book had me riveted from its opening lines, and hasn’t let go of me yet, because I’m anxiously awaiting the next book in the series! Not to mention I can’t stop thinking about how I would react if faced with the same situation. Would I have the courage to stand, come what may, even if that meant death? Or worse . . .
Rodes’ narrator, sixteen-year-old pastor’s son Braxton Luther, is testament to her ability to bring complex human characters of any age to life on the page. Braxton is snarky but kind, confident in his own understanding yet insecure as a person, intelligent but naïve, and self-deprecatingly honest about his own inward-focusing tendencies. He’s a character you can’t help but love in spite of his flaws, and one who burrows deeper into your heart as he faces increasingly difficult choices and circumstances. It’s in these choices and circumstances that this story really packs a punch. Dystopian fiction isn’t everyone’s cup of tea, and it’s not something I naturally gravitate towards, but this story hits all the right buttons. It’s a frighteningly plausible scenario, and my insides are tied in knots for both Braxton and his best friend Eliza, but at the same time there is something fortifying and energizing about witnessing others dig deep in the face of extreme adversity. It strengthens your own resolve, firms your own convictions. As a reader who was already familiar with Rodes’ writing as Jennifer Rodewald, I was thrilled to find everything I love about her writing in this story. She has a remarkable ability to capture the heartbeat of her characters and her story with writing that is perfectly nuanced and so natural to read. This is an amazing beginning to her series, and I can’t wait to read the next instalment. A very interesting read that challenges your faith and makes you think about what's going on in the world. Braxton Luther is your typical, all about me, teenager who doesn't take anything seriously until his self-centered world comes crashing down around him. The Progressive party wins the election, to Braxton that's no big deal but to Eliza Knight it's a huge deal and he needs to wake up fast. Braxton doesn't like anyone forcing him to choose and at the same time he can't figure out what the bi A very interesting read that challenges your faith and makes you think about what's going on in the world. Braxton Luther is your typical, all about me, teenager who doesn't take anything seriously until his self-centered world comes crashing down around him. The Progressive party wins the election, to Braxton that's no big deal but to Eliza Knight it's a huge deal and he needs to wake up fast. Braxton doesn't like anyone forcing him to choose and at the same time he can't figure out what the big deal is why not to just check the box and join the side everyone is on so they can live easier. His family isn't folding against the government control and neither is the Knight's . A group called the Jackals is bullying everyone into joining or lose everything including their lives. Some major blows hit Braxton hard before he wakes and by then things are out of control! Can Braxton choose what's right for such a time as this? I tore through The Uncloaked in about a day, so I can say it was a smooth read and, particularly in the second half, a real page turner. The reader witnesses the rapid relegation of religion through the eyes of teen and pastor's kid Braxton Martin Luther, who fails to recognize the ramifications of the seismic political shift before it's too late. He's a flawed but sympathetic character whose devotion to his best friend Eliza is endearing. Braxton is the most well-developed character, which is to I tore through The Uncloaked in about a day, so I can say it was a smooth read and, particularly in the second half, a real page turner. Braxton is the most well-developed character, which is to be expected since we are seeing the world through his point of view. I longed for more depth in Eliza, whose strength of conviction is admirable. While I was sympathetic to her circumstances, I would've liked to seen more of her personality, particularly her flaws. Braxton chides her stubbornness, but he views her as barely less than perfect in every way. We get an inkling at the (cliffhanger) end that perhaps there is more resistance to the Party than Braxton or Eliza have known. That detail intrigued me since I wondered at the absence of any organized rebellion in spite of the widespread apathy that ushered in the new regime. It seemed as if a handful of diminishing nondenominational churches were all that stood in opposition to the nationwide demise of religious freedom. The Uncloaked by J. Rodes had me on the edge of my seat the entire book. I'm not sure what to say about it other than You Have To Read it! It really makes you stop and think! Could this be where we're headed if we don't start paying attention to what's going on in the world? Christians are being persecuted all over the world right now as I write this, but it couldn't happen here, right? Well, maybe we all need to wake up and look around a little more. I'll get off my soapbox now, lol, but seriou The Uncloaked by J. Rodes had me on the edge of my seat the entire book. I'm not sure what to say about it other than You Have To Read it! I was not expecting to be utterly swept up into the story so quickly! But Ms. Rodes hits the ground running in chapter one and lets the reader rest very little throughout the rest of the book. It feels so close to where life is currently in our country and how rapidly such devastating changes could actually become true. Considering all the heartache that these characters seem to about constantly endure, even before said changes show their true colors, I was so grateful that Braxton and Eliza's f I was not expecting to be utterly swept up into the story so quickly! But Ms. Rodes hits the ground running in chapter one and lets the reader rest very little throughout the rest of the book. It feels so close to where life is currently in our country and how rapidly such devastating changes could actually become true. Considering all the heartache that these characters seem to about constantly endure, even before said changes show their true colors, I was so grateful that Braxton and Eliza's friendship was sweet and fairly uncomplicated. Each time they had a cute moment together, it allowed me to take a breather and just imagine being a teenager again. Yet this story is not for the faint of heart. Awful, terrible things begin happening and our characters have much to endure. And then there's that cliffhanger ending! Let's just say it's a good thing that I had book two at the ready immediately. I will have to admit that Braxton bugged me several times during the story. I know he's a teenager with all his teen angst, but I got rather irritated at his flip-flopping back and forth. He could never seem to land on exactly what he felt about any of the changes happening in his world. A little bit of that I can understand, but when one particular, obvious awful thing happened he still couldn't decide! I was grateful that by the end, he finally seemed to settle a little bit. Book two helped my feelings about him as well. The Uncloaked by J. Rodes gave me serious flashbacks to my tenth grade when I learned about the twentieth century. Reading about Kasen taking over, was like reading a page out of Hitler’s book. Coming to power over a country beaten down by the reminders of old conflicts and overly strict rules. Check. Targeting the youth and turning them into fanatics. Double check. I have to admit that I didn’t feel very patriotic with this America because it was barely recognizable. It was a land of rules and r The Uncloaked by J. Rodes gave me serious flashbacks to my tenth grade when I learned about the twentieth century. Reading about Kasen taking over, was like reading a page out of Hitler’s book. Coming to power over a country beaten down by the reminders of old conflicts and overly strict rules. Check. Targeting the youth and turning them into fanatics. Double check. I have to admit that I didn’t feel very patriotic with this America because it was barely recognizable. It was a land of rules and regulations and very little freedom. So while reading of the Progressive Party’s takeover, and everyone bemoaning how this couldn’t happen to their America… well, it was an unrecognizable America to begin with. I enjoyed Braxton, he reminded me a little of Percy Jackson, a Percy Jackson with severe anger issues. His perspective wasn’t always the most clear and he did many things that I never would have, but on a whole I liked him. That ending though… man I wasn’t sure what to think of that. I enjoyed this book very much. I look forward to finishing the series. This made me think of today's world so very much while I was reading. My only complaint was the overuse of the word Crikey. I received this book through SLB tours for free. A positive review was not required. All opinions are my own. I have loved Jennifer's romance work for a while. I was hesitant to read this book as it was outside of my normal comfort zone of genres but boy am I glad I did. This was an amazing read. Im anxiously awaiting the other two in the series. I'll be purchasing paperbacks for friends and family fot sure. What an amazing journey, so far! With enough realism to be frighteningly visual! A completely different take on end times events, and yet a riveting and visceral experience you can feel to your soul. Glad I got the trilogy! Too bad I have to go to work tomorrow! When the Progressive Reform Party's candidate Kasen Asend wins the latest presidential election, Braxton Luthor doesn't see what the big deal is or why his preacher father has been warning everybody about the dangers of his agenda. Braxton just knows that, like with every other new presidency in the history of the nation, nothing will change and the big campaign promises will never see the light of day. Oh man... was he ever wrong! What follows is a terrifyingly realistic picture of what the fut When the Progressive Reform Party's candidate Kasen Asend wins the latest presidential election, Braxton Luthor doesn't see what the big deal is or why his preacher father has been warning everybody about the dangers of his agenda. Braxton just knows that, like with every other new presidency in the history of the nation, nothing will change and the big campaign promises will never see the light of day. Oh man... was he ever wrong! What follows is a terrifyingly realistic picture of what the future of our country could one day become and a look at when apathy becomes second nature and what danger that can bring. The Uncloaked is a book that really makes you stop and think. It's something I hope everyone will read because it's so relevant to the world we're living in right now. There were times when I'd want to shake Braxton and tell him to wake up and pay attention to what was happening... how could he not see where everything was leading? But then I stopped for a minute and thought about it... I could see myself in him, in his disbelief. I've been guilty (as has probably almost everyone at one time or another) of seeing/hearing something seemingly outrageous about the way the world is headed and not believing things could ever get that bad or go that far. But sometimes, small things, that we overlook or ignore, can eventually lead to big changes that we feel come out of nowhere because we didn't take it seriously enough. This book also had me wondering if I'd be brave enough to stand against what's wrong even when facing dire consequences for not going along with the so-called status quo. I'm probably not making any sense and am completely botching what I'm trying to say, but this book has really struck a chord with me. I don't think I can adequately express how much I absolutely loved The Uncloaked. It was a really fantastic dystopia, one of the best I've ever read. It wasn't a nice, sweet read. It had dark moments and made me do some of my own soul searching. It made me look at the world today in a new way and made me take a hard look at the path we could be headed towards. It made me realize that apathy and complacency are their own forms of evil. I'm so ready for the sequel; it can't come out soon enough! I can't recommend this book highly enough! Seriously... everyone should read it! I've never read a dystopian novel before (don't even really know what that is...but I know it has something to do with the future not turning out so well, kind of like the "Hunger Games" novels). Anyway, I read this book because it was written by one of my favorite authors, who, under another name, writes amazing contemporary fiction. So I had to give this book a try. It did not disappoint. In "The Uncloaked" we get a look into the not-so-distant future, when the election of a new president has I've never read a dystopian novel before (don't even really know what that is...but I know it has something to do with the future not turning out so well, kind of like the "Hunger Games" novels). Anyway, I read this book because it was written by one of my favorite authors, who, under another name, writes amazing contemporary fiction. So I had to give this book a try. It did not disappoint. In "The Uncloaked" we get a look into the not-so-distant future, when the election of a new president has ushered in a time of serious persecution for Christians. Since this is futuristic, it is the author's best guess, based on what we know from Scripture, about what the years leading up to the end times might look like. I think she did a pretty good job of giving us a little taste of what might be in store. The main character, Braxton Luther, is a teenager who is pretty used to his status-quo existence...until it's no longer possible. His pastor father is tortured, his best friend's family's house is burnt down, and he is being hunted by a group of vigilantes called Jackals who work for the government, trying to get people to convert to the progressive side and receive the mark, a tattoo on the back of their necks (which makes them "cloaked") or live to regret it. “THEY’VE WON. GOD HELP US.” This is the opening line of The Uncloaked. It starts off with a bang and never lets up. This is an edge of your seat, thought provoking, youth dystopian novel with so many unexpected twists and turns that you won’t want to put it down. Eliza was such a wonderful character who had so much courage and never wavered in her faith no matter how hard things got. You can’t help but wonder if you would react the same way she did if you were in her place. Braxton, on the other “THEY’VE WON. GOD HELP US.” This is the opening line of The Uncloaked. It starts off with a bang and never lets up. This is an edge of your seat, thought provoking, youth dystopian novel with so many unexpected twists and turns that you won’t want to put it down. Eliza was such a wonderful character who had so much courage and never wavered in her faith no matter how hard things got. You can’t help but wonder if you would react the same way she did if you were in her place. Braxton, on the other hand, struggled with what was happening and the choices he was given. You empathized with him and his decisions, whether you agreed with him or not, because his ultimate goal was to keep his family and friends safe. I have only read one other Jennifer Rodewald/J. Rodes book. But, after reading this book and Ordinary Snowflakes, she is now an auto buy author for me. In fact, all her books are now waiting for me on my kindle. I was given a copy of this book by the author. I was not required to write a positive review. Be warned, this book is NOT an easy read and is not for the faint at heart. That being said, this has got to be one of the best books with a solid Christian message behind it that I have ever read! I love the characters, good and bad and written with such depth that I could picture them in my head during the conversations. Voting a new president and a new party is no big deal right? Especially to some of the local teenagers, but this story is about choices that w I could not put this book down!!! Note: This review covers all three books in this series. It is beneficial to read them in order. This well-written trilogy will keep you on the edge of your seat with non-stop heart wrenching action. As a YA dystopian work of fiction, this story and it's characters will make you stop and think about how you would respond to the same circumstances. How many of us would give in to the desperation of a persecuted life and choose to believe the lies of a better life by going with the easy choice? The Note: This review covers all three books in this series. It is beneficial to read them in order. The characters in these stories are well-written and believable. From the typical self-centered but fumblingly courageous PK's son to the cooly dangerous woman in charge of The Party, you'll find each character to be well thought out and intriguing in their own way. Teenagers will be well able to identify with Braxton's struggle with his parents and his struggle to fully comprehend the changes and the persecution that come from the changes in the political world. While there is a touch of romance throughout the story line of the three books (I love the development of Braxton and Eliza's tender romance even when it hit rough patches), these books are not a light read. There are a lot of dark times and some subject matter that can make this an edgy series. There will be times you just want to cry your eyes out and then there will be times when you can feel your own resolve strengthen to stand firm in your faith. You really don't want to miss out on reading this series! A pacy and interesting Christian dystopian starring a troubled PK. I’m a PK too so I have a bit of a soft spot for protagonists struggling with their father’s identity and how it impacts on their own. The MC in this is Braxton. His father is a celebrity pastor with no time for him. Understandably then, Braxton rejects or struggles with a lot of what his father says. However his best friend is a true believer girl who encourages him to stay on the straight and narrow. An evil government that hates A pacy and interesting Christian dystopian starring a troubled PK. I’m a PK too so I have a bit of a soft spot for protagonists struggling with their father’s identity and how it impacts on their own. An evil government that hates Christians comes into power. Braxton, his family and his best friend are forced to decide whether or not they’ll comply with government regulations that require all citizen's to become sealed. Watching how their choices play out is what makes this book interesting. Very intense. In fact, after the first couple of chapters, it continues to build, all the way to the end, never letting up. Sadly, things that happen in this book have happened before and could happen again. This book is so fast paced! It's scary in a, "this could never happen but it so could" kind of way! What will happen next? Anyone who loves dystopian fiction will enjoy this. I flew through it, and can't wait to read the next one! Even though I am (well) past my YA years, I enjoy a good story with young protagonists. And with the first book in her Uncloaked trilogy, J. Rodes delivers a fast-paced and engaging story that is both believable and possible. When a new president is elected, Braxton Luther doesn’t understand the uproar it causes throughout his father’s church. It will be just like every other election: nothing will change. But change is exactly what comes, forcing both Braxton’s family and that of his best friend Even though I am (well) past my YA years, I enjoy a good story with young protagonists. And with the first book in her Uncloaked trilogy, J. Rodes delivers a fast-paced and engaging story that is both believable and possible. But change is exactly what comes, forcing both Braxton’s family and that of his best friend Eliza’s into hiding. As Braxton struggles with the decisions of the others, he wages an internal battled. If they’d just the seal of The Party, they wouldn’t have to hide. They would have food, heat…homes. When he makes the decision to protect Eliza, he learns the hard way that the easy choice sometimes comes with a price you are unwilling to pay. Uncloaked is the perfect introduction to this series, introducing many of the key players and setting the stage for events to come. Braxton is a typical teenager who tries his best not to make waves in school, questions his parents’ decisions, feels as though he doesn’t measure up to his ex-football-player-turned-mega-church-pastor father, and spending time with his best friend. Despite Braxton’s rebellious streak, I couldn’t help but like him because of the way he listens to and protects Eliza. And the good news is…this trilogy is complete, so if you’re just getting started, you can read it all the way through (you won’t be disappointed). This review is for the full trilogy, but the stars are for individual books of the series. I read the the complete The Uncloaked Trilogy by J.Rodes, also known as Jennifer Rodewald in complete succession, without any other books in between. How could I? Once you start this trilogy, starting with The Uncloaked, you will be hooked. Dark and intense, this dystopian series delved deep into the concept of faith in times of disc This review is for the full trilogy, but the stars are for individual books of the series. Dark and intense, this dystopian series delved deep into the concept of faith in times of discourse. There's a strong political emphasis as with all dystopian stories. Organizations to rebellions, ramifications of political upheaval to the dismissal of religion, the story begins, but also a tad bit prophetic in what seems to be history repeating itself in different ways. The Uncloaked Trilogy starts with apathy in The Uncloak to the reveal in Tearing the Veil, and eventually the conclusion, the decision and the answer in Charging the Darkness. As in life, even what we presumed the end of the series, a story, there's possibility of more, and that is by choice, of life. The Uncloaked Trilogy will challenge your belief system, will question your faith, and encourage you to see life, in more than one perspective, or at least deeper. Will you fight for your faith? I just finished this book and i am about to read the second, but I wanted to rate this book just so people will see how amazing of a book this is!!! So I'm guessing y'all read the synopsis so y'all know what its about, and when I first read that I thought it kind of sounded like the "Hunger games" with a Christian spin on it, but its actually more like the holocaust, how the Germans clamped down so hard on the Jews and religion, except it's fifty years into the future. Braxton Luther has to decide what he is willing to die for, or what he is willing to live for. Y'all, all I can say is that this is book worth taking the time to read and you won't regret it! Will you stand for what you believe or will you submit to a government that goes against everything you hold dear? The Uncloaked Trilogy is a dystopian look at a Godless future. The plot is solid and reads fast. The characters are well developed and realistic. These books are written for young adults, but I really enjoyed reading them. I was given these books by the CelebrateLit for review purposes. All thoughts are my own. Fro Will you stand for what you believe or will you submit to a government that goes against everything you hold dear? The Uncloaked Trilogy is a dystopian look at a Godless future. The plot is solid and reads fast. The characters are well developed and realistic. These books are written for young adults, but I really enjoyed reading them. From Sellout to hero, by way of the den. Braxton Luther finds himself in the crossfire of a new order and discovers apathy is a dangerous option. Some may think this persecution is fiction but for the eight years from 2008 to 2016 we saw a rapid rise in attacks on people of faith; from all sides. This book is well written and scary. Scary, mind-blowing, prophetic. I don't know if I like it or not, but now I have to read the next book in the series. This book is incredible! From the world building to character development, each part is masterfully woven into a story that will make you think long and hard about how you would respond in the same situation. I can’t wait to read the second book! I highly, highly recommend this book! J. Rodes lives on the wideplains somewhere near the middle of Nowhere. A coffee addict, pickleball enthusiast,and storyteller, she also wears the hats of mom, teacher, and friend. Mostly,she loves Jesus and wants to see the kids she's honored to teach fall in lovewith Him too.